Any vegetables you prefer can be uses in this dish. Try it with Brussel sprouts, sweet potatoes or beets. It is beautiful dish to serve with all the colors of the Fall. 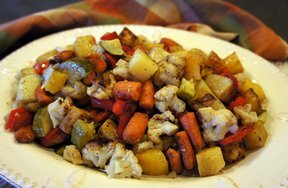 Peel rutabaga, carrots and parsnips; chop into 1" pieces. 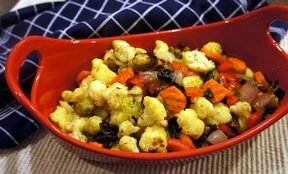 Place vegetables on a baking sheet pan. In a small saucepan, melt butter. Stir in oil, thyme, sage and nutmeg. Drizzle butter mixture over vegetables and toss to coat them completely. Season with salt and pepper. Pour the balsamic vinegar over the vegetables; toss lightly. Cover tightly with foil and bake for 30-40 minutes. Remove foil, toss the vegetables and continue to bake until the vegetables can be easily pierced with a knife, 20-30 minutes. 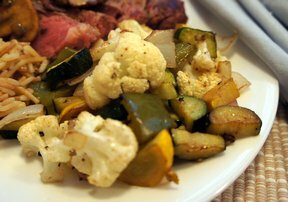 Place roasted vegetables on a platter around your meat or by themselves and serve. "I loved the flavor of this. I served it with a roasted chicken and it was beautiful on the table. I used brussel sprouts instead of zucchini. Don't pass on the rutabaga...even my kids like this."